Activists says some of the results transmitted on the IEBC portals vary with the votes in the forms 34A. - Bana Kenya News, Real African Network Tubanane. Home Nairobi Activists says some of the results transmitted on the IEBC portals vary with the votes in the forms 34A. Activists says some of the results transmitted on the IEBC portals vary with the votes in the forms 34A. 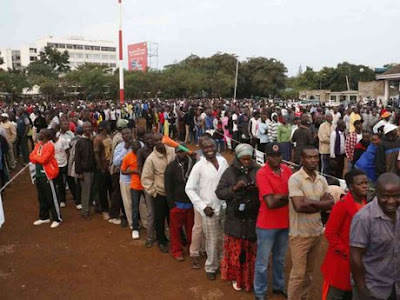 The voting process in the country has been faced with a lot of challenges as some of the forms 34A contradict with the online streaming results given out by the IEBC. The activists also claim that the forms they have contradictory information. Under 'Kura Yangu Sauti Yangu', they said the results do not conform with constitutional requirements requiring the support of form 34A. "Since it started announcing results yesterday, the IEBC has not made available, as required by law, copies of form 34A on its public portal," group chair George Kegoro said on Wednesday. The group also claims IEBC is deducting votes from Opposition leader Raila Odinga and adding them to President Uhuru Kenyatta's tally. He said results transmitted varied in forms acquired in Dagoretti North, Langata, Nandi Hill, Kisumu Central and a Kipchebor polling station in Ainamoi. In Kilimani ward, Kegoro said, the form claims no rejected votes were recorded, contradicting portal results showing four votes. He said the form also noted 508 valid votes while the IEBC portal reports 504. He added that at South C's Kewi polling station, results from stream one contradict the valid votes recorded. While 439 votes were recorded on form 34A, the IEBC said 416 votes were recorded. In Kipchebor, the group claims four votes were deducted from Raila and given to Uhuru. The government denied claims it had planned to rig the election and the IEBC assured its systems were secure. Officials led by chairman Wafula Chebukati has also asked the public to wait for their official announcements. Some of the forms that signed by the agents were different from the ones posted on the IEBC portal. Some agents posted the forms on social media with contradicting information than the one on the IEBC portal.